Spend a day in Indy and you'll find a surprise around every turn. With vibrant cultural districts like Fountain Square, Mass Ave, and Broad Ripple, experience a diverse selection of restaurants, entertainment, and attractions all connected to Downtown via the Cultural Trail. Feel the excitement of world’s largest children’s museum as you walk up and notice the dinosaur peeking into the museum. Spend the afternoon traveling to different countries and experiencing new cultures with your family and friends. Spend the day with animals of all kinds as you explore the Indianapolis Zoo. Touch sharks, race a cheetah, view dolphins from more than 10 feet under water, feed birds and immerse yourself in the animals natural environments. A day at the Indianapolis Zoo is like taking a trip around the world! From quilt exhibits to an Asian collection the Indianapolis Museum of Art has something for everyone. Pack a picnic or take a stroll through the 100-acre park and enjoy the beautiful landscape filled with artwork. Experience a journey through the campus of interactive history park, Connor Prairie. Soar high into the sky as the wind whisks you up into a hot air balloon ride. Spend the day traveling through various time periods of history while learning about science, nature and art. Feel the crisp wind on your face as you bike around 250 acres, a scenic canal and multiple attractions located downtown. An afternoon at White River State Park with family and friends is the perfect way to enjoy the best park in Indy. Stroll through countless exhibits at one of the United States' oldest and largest historical societies. After taking a tour, grab a refreshing beverage at the Stardust Café and sit outside to enjoy the beautiful Indy Canal. As you step off Monument Circle into the historic Hiblet Circle Theatre your ears will fill with the wonderful sounds of the symphony orchestra. Indulge in a refreshing beverage as you sit back and enjoy the company of dozens of musicians. Spend the day like a sports legend as you experience interactive exhibits that will make you feel like one of the professionals. Challenge yourself with the historian trivial challenge or take a look at artifacts donated from colleges around the nation. Take a run, stroll, or bike ride down the Monon Trail and visit various neighborhoods along your way. Stop in cute cafes, shops, breweries and restaurants as you explore the trail that cuts north to south of the city. In Indy you'll find yourself in picturesque landscapes like trails, creeks, lakes and more. 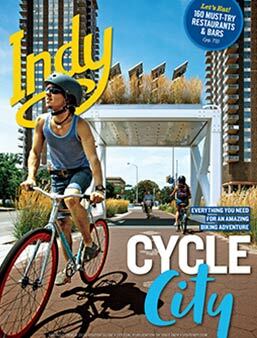 Take a kayak down the Indianapolis Canal, zip line from 50 feet above ground at Eagle Creek, or take a bike ride down the 8-mile Cultural Trail.